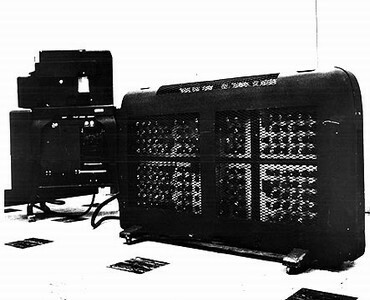 Announced on September 27, 1946, the IBM 603 Electronic Multiplier was the first electronic calculator ever placed into production. It consisted of two boxes: the Type 603 calculating unit (right foreground) and Type 520 punch-read unit (left background). This machine provided multiplication speeds several magnitudes higher than earlier electromechanical devices. In fact, computing speeds were so much faster that multiplication could be performed without the necessity of interrupting card feeding. All multiplication was performed by the electronic tubes clearly visible here in the 603 calculating unit. The factors read by the 520 punch-read unit were transferred over a cable to electronic counters in the 603. A control panel on the 520 made it possible to wire the machine for different multiplying and checking operations. Calculation was performed almost simultaneously, with the result transferred back to the 520 in time to punch the answer in the same card. The operation was continuous, with a card being read, calculated and punched each cycle. The 603 had a maximum reading and punching speed of 6,000 cards an hour, and it could multiply a six-digit multiplicand and a six-digit multiplier for a 12-digit product.